A classic Danish layered cake, “lagkage” with a modern twist. The cake is normally baked for birthdays and other festive occasions. We were invited to a dinner party tonight and I had volunteered to make the desert. I had some beautiful blackberries in the freeze from my aunt and then I defrosted them they were too pretty to put into the crumble I had planed so I made a layered cake. I will not say I baked it as the cake part of the cake was store brought – there is just no reason to try to do that your self. They layers are pretty, thin and tasty then they are store brought. But I did make the custard my self (first time – yeah) and the blackberries whipped cream (yum). I always buy the layers, but if you need to bake the layers your self – here is a recipe. Whisk flour and milk and bring the cream to a boil by constantly whipping. Flavor with vanilla sugar. sprinkle sugar over the cream while it cools so that it does not pull the skin. It will thickens as it cools. Mush berries with the sugar. Make a good stiff whipped cream and berry mass turn gently into whipped cream. Smear cold custard in a layer (about ½-1 cm) over the marzipan – that's most of the custard. Eat the rest. Lay on a second layer of cake smear on a layer of the berry cream. 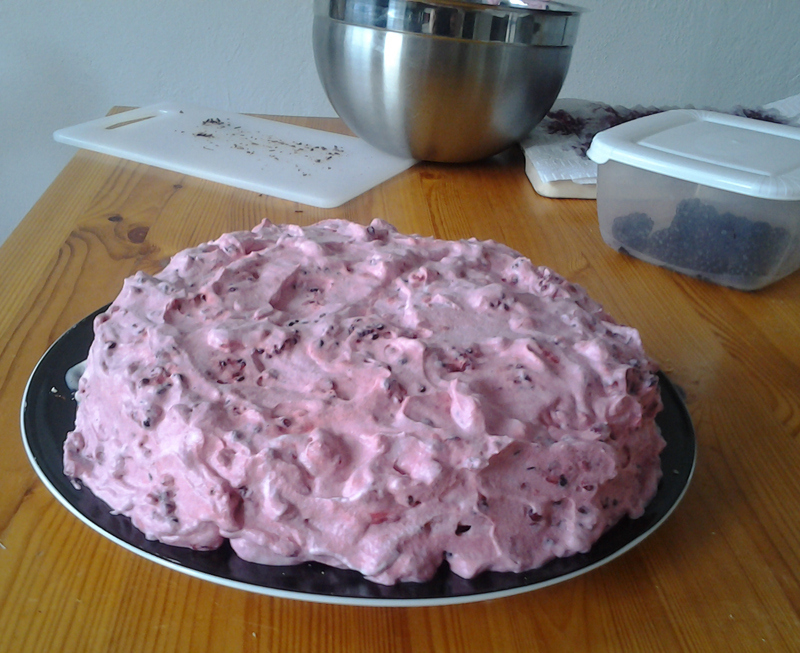 Add the third layer of cake and add the rest of the berry cream over the cake both on top and on the side. If you have saved a few berries you can add those as decoration. A bit of crushed caramel works really well as well. I normally buy my layers, but you can find a recipe here, if you can't buy them where you are. You can see in the picture, just how thin the layers should be.